A weekly newspaper in Surrey has launched a campaign calling for the Government to introduce roadside drugs tests following the death of a schoolgirl last year. 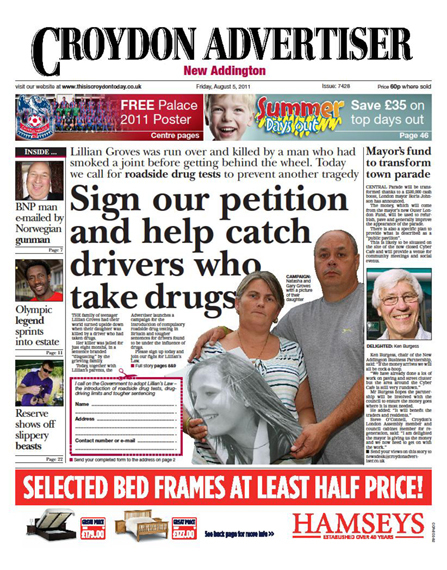 Northcliffe weekly the Croydon Advertiser joined forces with Lillian Grove’s parents to launch ‘Lillian’s law’ and is urging people to sign a petition which has been printed in the paper. Lillian, 14, was hit and killed outside her home by a driver who had been smoking cannabis. The driver of the car was handed an eight-month sentence, despite police finding cannabis in his blood and a half-smoked joint on his dashboard. The focus of Lillian’s Law will be the introduction of testing devices, similar to breathalysers, to enable police to accurately detect if a driver is under the influence of drugs. Senior reporter Gareth Davies came up with the idea for the campaign and said the paper had formed a good relationship with Lillian’s parents Gary and Natasha ever since her death. Said Gareth: “The family went out to Central Parade, New Addington, the morning after the riots. Despite the parade being targeted the night before, with the Co-op completely destroyed by fire, more than 400 people still signed the petition. “On Sunday, the family went to the air show in Eastbourne on the invitation of MP Stephen Lloyds. They managed to get more than 1,000 signatures. We’ve also had a significant response through the paper in terms of people cutting our and sending in petition slips. He added that the responses would be sent to Downing Street over the next few weeks and the family plan to knock on every door on the New Addington estate. The paper carried the campaign on the front page and ran a double page spread. They have also had T-shirts printed and plan to rally for support in Croydon town centre. Editor Glenn Ebrey said he was confident that the campaign would make an impact. Lillian’s parents are adamant a roadside test would have found her daughter’s killer John Page was unfit to drive before he hit Lillian on 26 June last year, because he had admitted in court to smoking cannabis earlier on that day. Under current law is is an offence in the UK to drive while ‘unfit through drugs’, though proving it can be difficult. A ‘drug alyser’ device has yet to be approved by the Government. Good luck to the Croydon Advertiser with a thoroughly worthwhile campaign that deserves to be taken extremely seriously. Drug-driving is becoming almost commonplace. Mistakenly, it’s always been regarded as the poor relation of drink-driving.